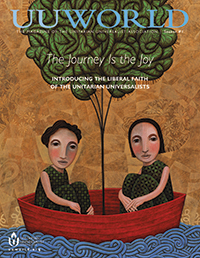 UU World's first "seeker issue" is designed specifically as an introduction to Unitarian Universalism. The 32-page magazine is an anthology of articles and photographs originally published in UU World and other sources, organized in four sections: Who We Are, What We Believe, How We Gather, and What We Do. Featuring Melissa Harris-Perry, Galen Guengerich, Gail Geisenhainer, Kendyl Gibbons, and more. The seeker issue is suitable for use in path to membership classes and congregational or individual outreach to people interested in learning more about Unitarian Universalism. I think this is a great first magazine for new members. For me, the cover was what attracted me to the magazine. The joy is in the journey, not in the magazine cover. The people depicted on the cover do not look joyful because the journey is the joy, it is not about looking joyful. While the content of the World Seeker issue is wonderful, I agree that a more inviting and joyful cover image is imperative to create a wholeness of UU message and imagery. At this congregation, the introductory magazine is gifted to new members...however, the cover image is anything but welcoming them on a Joyful Journey. Most of the articles in this special seeker issue are excellent. However, the cover leaves a lot to be desired. The two people on the cover do not appear to be on a joyful journey at all. Before my congregation orders any of these, we will wait for a new cover. I didn't get any further than the cover. "The Journey Is the Joy". To my eye there is a huge disconnect between that phrase and the illustration. I don't get any joy from this cover. I would give gifts of many issues of UU World, but not this one. First impressions matter. I applaud the idea behind this "seeker" issue. I don't feel invited in.